This resource was created in order to relief the stress of applying to colleges. This website will provide helpful tools that you may use for essays, placement exams, essays, etc. MOST OF YOUR COLLEGE QUESTIONS CAN BE ANSWERED BY BROWSING THIS PAGE. REMEMBER THAT YOUR MOST IMPORTANT RESOURCE IS YOUR SCHOOL COUNSELOR. PLEASE MAKE SURE TO SPEAK WITH YOUR COUNSELOR TO OBTAIN FURTHER ASSISTANCE. Yes. A college degree is still worth the investment. 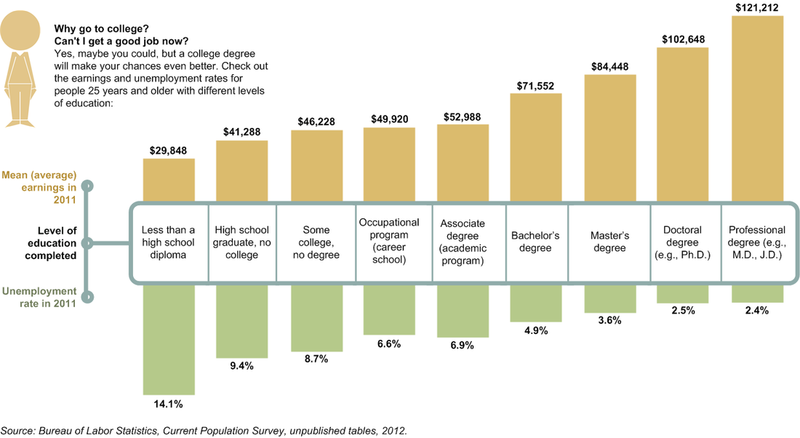 Workers with a bachelor's degree will earn close to $1 million more than those with only a high school diploma. Employment opportunities for people with a college degree are statistically higher than those without one.